Knoch Knolls Park is a park in Naperville, IL. This photo was sent in by CTTF. He writes: "Knoch Knolls park is one of the many parks along the DuPage River. Originally this park's only feature was a small building with a day care and a restroom (with no urinal in it). It was later replaced by the brand new Knoch Knolls Nature Center in 2014. 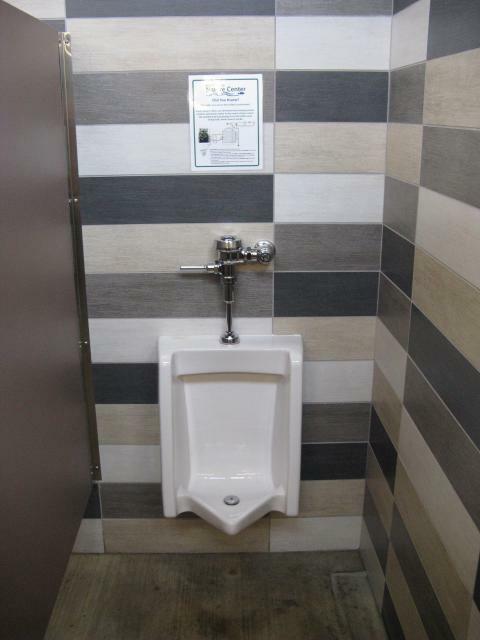 The thing that makes this urinal special is that it is flushed with rainwater collected from a cistern on the roof of the center as indicated by the sign above the fixture. A discus golf course and bigger parking lot were also added as well."